Hermann von Helmholtz was a towering figure of nineteenth-century scientific and intellectual life. Best known for his achievements in physiology and physics, he also contributed to other disciplines such as ophthalmology, psychology, mathematics, chemical thermodynamics, and meteorology. 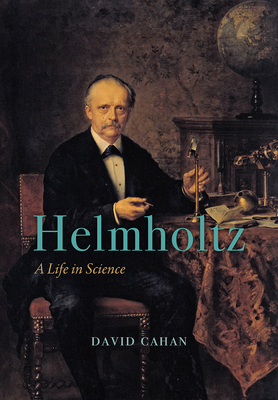 With Helmholtz: A Life in Science, David Cahan has written a definitive biography, one that brings to light the dynamic relationship between Helmholtz’s private life, his professional pursuits, and the larger world in which he lived. Utilizing all of Helmholtz’s scientific and philosophical writings, as well as previously unknown letters, this book reveals the forces that drove his life—a passion to unite the sciences, vigilant attention to the sources and methods of knowledge, and a deep appreciation of the ways in which the arts and sciences could benefit each other. By placing the overall structure and development of his scientific work and philosophy within the greater context of nineteenth-century Germany, Helmholtz also serves as cultural biography of the construction of the scientific community: its laboratories, institutes, journals, disciplinary organizations, and national and international meetings. Helmholtz’s life is a shining example of what can happen when the sciences and the humanities become interwoven in the life of one highly motivated, energetic, and gifted person. David Cahan is the Charles Bessey Professor of History at the University of Nebraska-Lincoln. He is the author of An Institute for an Empire: The Physikalisch-Technische Reichsanstalt 1871-1918 and coauthor of Science at the American Frontier: A Biography of DeWitt Bristol Brace. He is the editor of Hermann von Helmholtz and the Foundations of Nineteenth-Century Science and Helmholtz's Science and Culture: Popular and Philosophical Essays. "Cahan effortlessly depicts and analyses Helmholtz’s trajectory as a movement through various disciplinary, institutional and cultural contexts. His account is not a simple biography or a mere retracing of events. As the subtitle indicates, its ambitious goal is to explore the relationships between life and science. . . . Cahan demonstrates that Helmholtz strikingly embodies the cognitive and ethical potential of science. His book is the new standard for all Helmholtz scholars, a comprehensive guide and crucial resource for historians, philosophers or sociologists interested in this scientific luminary. Helmholtz is also a highly topical book for those impressed by and convinced of the social significance of science." "A magisterial biography of one of the last of the great polymaths." "An encyclopedic biography of Herman Helmholtz . . . . Cahan scrutinizes Helmholtz's early life as the son of an educator and a philosopher, his education in medicine, service as a military physician, and rise in science at a time when many modern sciences were taking shape. Cahan describes Helmholtz’s personal life, his two marriages, and the interactions between his social circle, politics, and science. Special attention is given to the scientific and social contributions of Helmholtz's second wife, Anna. The final chapter discusses how Helmholtz’s legacy evolved and was used (and abused) after his death. Cahan's presentation is lucid, patient, and detailed, with frequent backtracks to view material from multiple perspectives. . . . Helmholtz is an excellent, in-depth examination of one of 19th-century Europe’s most influential scientists. . . . Recommended." "To produce a definitive biography of a protean figure like Helmholtz is a major scholarly achievement, and that is what [Cahan] has accomplished. . . . The treatment is richly detailed, judicious, quietly conservative, and eminently readable. . . . Good biographies paint pictures of individual lives, and Cahan does that vividly . . . . To read David Cahan's biography is to be drawn into meditation about the ironies of scientific fame and the varieties of scientific creativity."